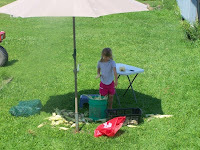 Mom gave us a bunch of corn this weekend. So, yesterday was processing day. 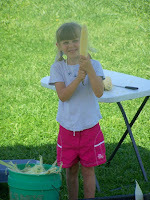 Becky helped Daddy husk the corn. (The boys did too, but they came out later.) 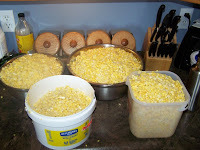 I did all the cutting, blanching, cooling, and packing of the corn. Here it is, all ready to be blanched. We were able to get 72 cups of corn in the freezer, and there was still enough left over to have corn on the cob for supper! Yum!